Ok, a full day and a night of testing the solar powered air conditioning system proves that it can and does work. My stuff costs about $2,000. You may pay a bit more depending on where you look. In this video I show you where to get solar panels as low as 50 cents per watt. Yes, it is true. You may find that after shipping its $1 per watt. That is cheap and good. Its still cheaper than the full retails of $5 to $10 per watt. The inverter retails for about 500 but you can get a tiger claw pure sine wave inverter off amazon for about $179. I read lots of good reviews about them. 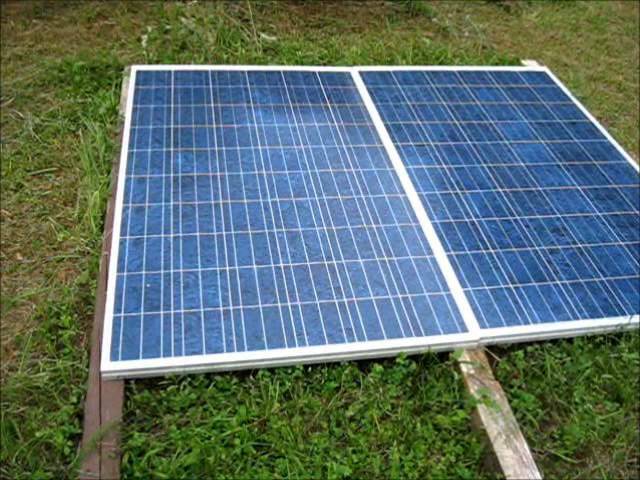 Check craigslist for second hand or discounted, scratched or dented solar panels. Check sunelec.com for low priced solar panels. you elaborate on having more than one charge controller? Took a lot of time to save up but now I have three of them. ozone could kill anything that built up. Was a junk yard when I got here. We have been cleaning it recently. enclosed with AC. I keep a dozen of them in the freezer during the summer. the melting ice cubes, you can refill the ice cube trays several times. That’s gotta’ save at least a nickel too. THE NORMAL RUNNING AMPS, A LARGE CURRENT DRAW BUT FOR VERY SHORT DURATION. consumption, not try to make it cheaper.